GETRAG has secured a contract from Volvo to supply the electric drive unit 1eDT240 for the electric version of the Volvo C30. Volvo Car Corporation is building up a small fleet of the vehicle in the course of this year. This test fleet serves for research purposes, aiming for a high environmental profile, and will use a leasing model to selected customers such as companies and governmental bodies. So far, the car is not available for end-customers. Currently the highest-performance single-motor drive unit 1eDT240 in the group's product portfolio uses a permanently excited synchronous machine with a maximum output of 82 kW (at a nominal voltage of the electric energy storage device of 360 volt). The coaxial drive unit was specifically developed for the demanding requirements of virtually silent purely electric driving. It is characterized by the partial integration of the electric motor and therefore for its very compact design. The development process placed particular emphasis on noise-optimized gearing and very high efficiency. The maximum drive torque of 2,400 Nm offers sufficient traction force to make even sporty acceleration possible. The 1eDT240 drive unit benefits from use of large-scale series production parts from the GETRAG modular system. If required, the 1eDT240 can also be equipped with a higher-performance electric motor delivering up to 145 kW. It can be supplied in three different transmission ratios. "The 1eDT240 drive unit can be fitted in a wide variety of electric and hybrid vehicles with front or rear-wheel drive thanks to its compact, versatile design. This unit can cover the entire range from city to sports car and even light truck applications", commented Alexander Strube, Chief Program Engineer for E-Drive at GETRAG. 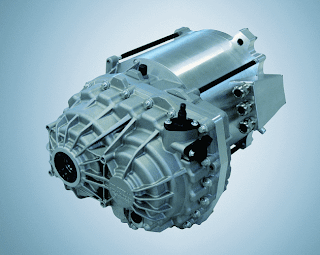 GETRAG has been active in the field of electric drive systems since 1992 and has already received several series production orders and a large number of development contracts in this area. Several electric-drive test fleets e.g. of the BMW MINI, the Mercedes-Benz B-Class F-CELL and the Necar Series, have already been equipped with GETRAG drive technology.